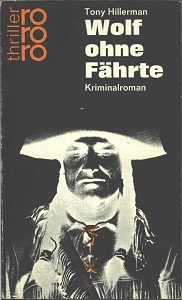 This is the first German edition of The Blessing Way. Published in paperback, this edition has a 2-color illustrated cover designed by Gisela Stege. Note from Louis Hieb's Tony Hillerman Abroad: "The literal meaning of the German title [Wolf ohne Fährte] is 'Wolf without a Trace (or Tracks)'" (Hieb, 1993:). Binding: Paper covers with a black-and-white photograph with some orange accents. The author's name, title, and publishers logo are printed in orange on the spine.